by Ron J. and Sidney Y. Over the last 23 years PB UMC has enjoyed a high profile presence i the annual PRIDE Parade. There were many years when our church was the only religious entity in the event. 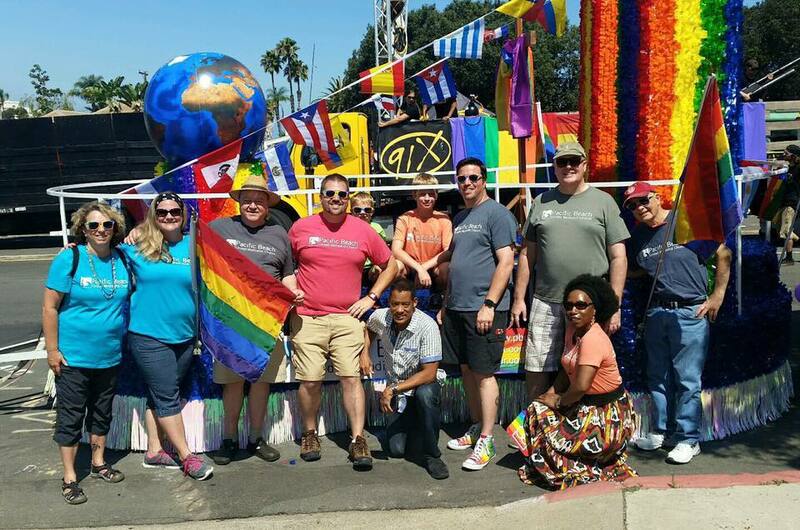 This year, PB UMC enjoyed the company of six other religious organizations as we made our way down the packed parade route. Our unit was led by a banner proudly declaring the presence of PB UMC, followed by a walking contingent of approximately ten people. Next in the line-up was Joe’s rather sizable Jeep pulling the church float, which was adorned by “The Holy Family” (Pastor Bob and his family) and, of course, float designer Louis. 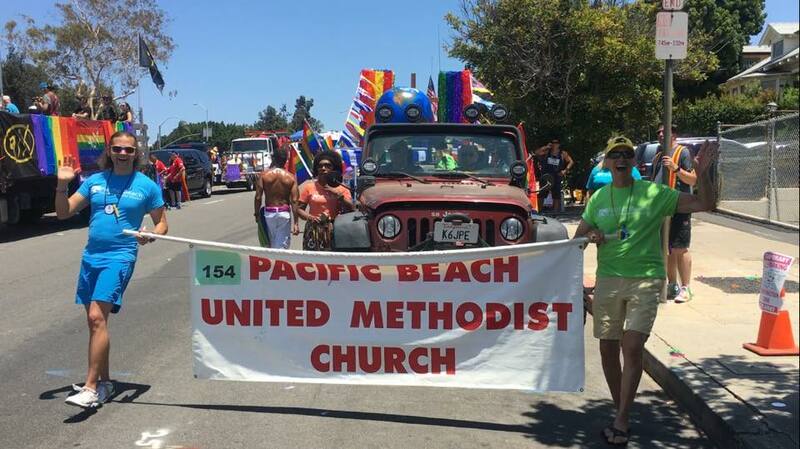 The entire PB UMC contingent included approximately twenty people who helped in various ways ranging from float construction to marching in the festivities. 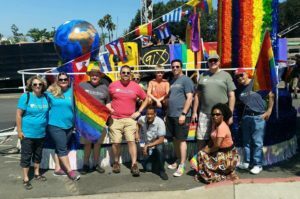 It was a moving experience to see so many people gathered to reach out to the San Diego LGBTQ community with the message of God’s love. At our Festival Booth, volunteers were able to pass out many handmade crosses made by Hope A. and helpers, along with pamphlets, notepads, water bottles, and pens. This meant a lot to visitors to the booth since we, as a community, are still grieving the loss of lives in Orlando. Through our participation this year, many people were able to learn about PB UMC.